Receive the gift of flamenco music and dance this holiday season–celebrate el Dia de los Reyes Magos (Three Kings Day/Epiphany, January 6) with los Reyes del Flamenco (the Kings of Flamenco)! Don’t miss TEN phenomenal flamenco artists on stage, singing, dancing and playing their hearts out, including a villancicos (Spanish Christmas carol) sing-along to complete your Dia de Reyes Magos! 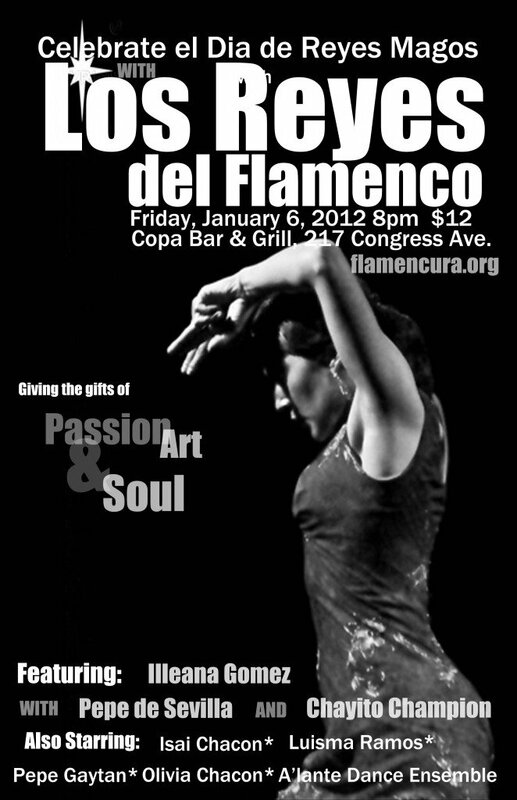 Show takes place Friday, January 6, 8pm at Copa Bar & Grill, 217 Congress Ave., Austin, TX. Tickets $12 at the door. Doors open at 7pm. Kids under 12 half-price!